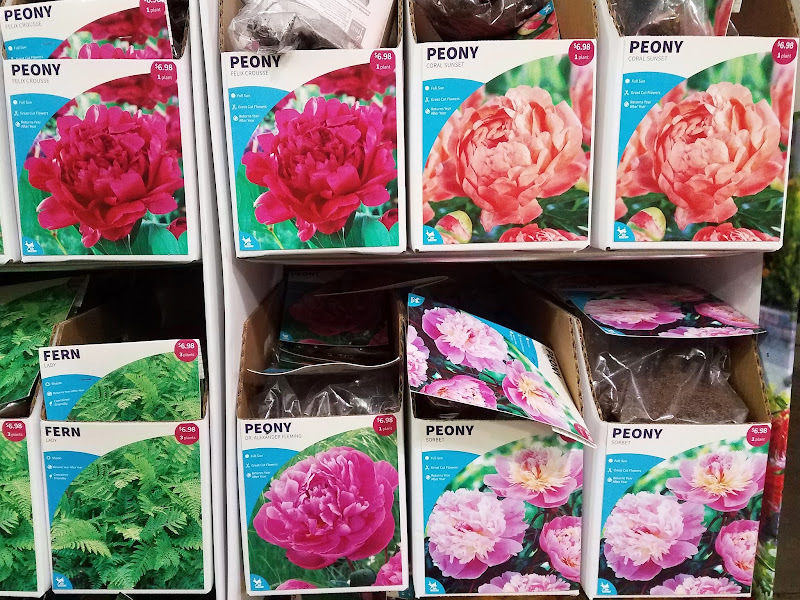 It's not exactly the best season to plant them, but if you need herbaceous peonies and you need them right now, then now might be a good time to stop into your local Lowe's Home Improvement store to grab some of these well-priced peonies. What especially caught my eye wasn't just the price, but also the selection. Yes, they have some of the well known and widely distributed standard varieties - Peony 'Dr. Alexander Fleming', Peony 'Felix Crousse', and Peony 'Sorbet', but they also have a coral peony for sale - Peony 'Coral Sunset'. This is the first time I've seen a coral peony offered as a bare root bagged and carded peony in a big box store. If you don't yet have a coral peony, this might be your opportunity to snag one for a great price! 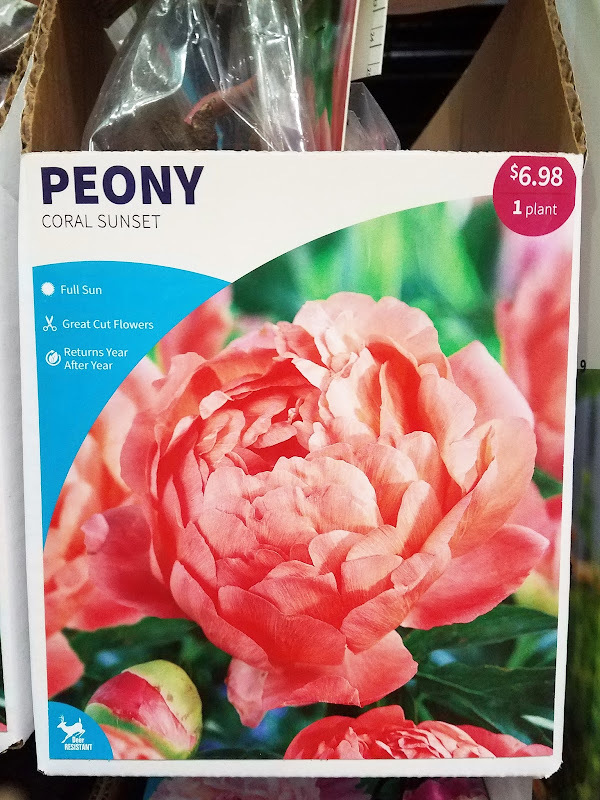 Peony 'Coral Sunset' for $6.98 per Root! Some of my favorite peonies have come from the bagged roots purchased at a big box store! There are some negatives, though--the roots are actually pretty small for a peony, probably won't bloom for a minimum of 2 years, more likely 3 or 4. They don't really look small if you don't have peony experience but just compare the bagged ones to a root from one of the big growers, there's really no comparison. And they aren't always true to name, either. A very inexpensive way to start out as long as the purchaser knows that it'll be a while before they get blooms. Yes you are correct. It will probably take a bit longer to get a bloom from the bagged varieties. However if you live in the South, the bagged varieties are probably a safer bet since they are likely a hardier, easier to grow and quicker to multiply variety that is offered in the bags (which may or may not be the case for more specialty varieties offered from a grower). Sometimes the same old varieties are also the "tried and true" varieties. Actually I am set to get 2 blooms on 1 out of the 3 $1.69 'Sarah Bernhardt' peonies I bought at Aldi's 2 years ago.